It was ten days short of the summer solstice: the ideal time to enjoy buglife at its peak. There are 24,000 insect species in the British Isles – of which around 2,000 are moths and 60 butterflies. The wildflower meadows around Kingcombe provide an ideal habitat for a wide variety of insects – in fact, the Dorset Wildlife Trust’s centre is something of a beacon for insect-spotters, who flock there during the summer months like… and here you can choose your metaphor: moths to a flame? Bees to honey? Flies all over something less salubrious? Each of these well-worn phrases evokes abundance. Insects – at least idiomatically – are associated with multitude. They swarm, they infest, they come in droves. At least, they used to. Even here, standing in the middle of one of the most gloriously unspoilt patches of British countryside, there is evidence of the catastrophic decline of insect species: what George Monbiot calls ‘insectaggedon’ and Michael McCarthy ‘the great thinning.’ Perhaps it was the blustery weather that kept the butterflies grounded, but as I followed the trackway through Cleaves and Stable Plot, across Lord’s Mead, Lady’s Mead and Mitchels [sic] Ten Acres, and then back along the Wessex Ridgeway back towards the Centre, there were nowhere near as many insects as I’d expected. It was a typical English summer’s day, in that it felt like early November and I was regretting not bringing my gloves. The wind clawed through the sycamore and chestnuts, yanking their leaves back at the wrist and setting their silver undersides streaming, while above them, the hilltops vanished into the low-bellied clouds. Tiny green grasshoppers, each no longer than my smallest fingernail, leapt out of the way of my boots. Occasional butterflies – and I’m sorry I can’t do better than ‘little brown jobs’ for these – tumbled over meadow thistles and small pale pink spires of common spotted orchid. Though still sporting a few petals, the yellow rattle was already going to seed, and the buttercups though plentiful had lost their dazzle and looked a little wan. The only insects I could see in abundance were six-spot burnets. They sat on individual knapweed flowers, as though they had personally selected the long, thin mauve petals to show off their wings to greatest effect. With its jet-black antennae extended like elegant evening gloves and the dramatic crimson spots on its glossy dark wings, the six-spot burnet is the Count Dracula of the insect world. As a caterpillar, it feeds almost exclusively on bird’s foot trefoil, an excellent indicator species of ‘unimproved’ land as it cannot tolerate high nitrogen levels associated with fertilised agricultural land. 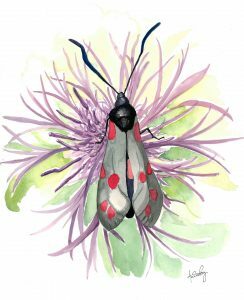 As this month’s diary goes up online, it is National Insect Week. Up and down the country, people – some people anyway – are building bug hotels and venturing into the great outdoors armed with magnifying glasses and moth traps in order to persuade their children to view these six-legged wonders at close quarters: to change, their status ‘from pest to guest’, as the tagline goes. Thirty-five of the UK’s bee species are facing extinction; insect biomass in Europe has fallen by between 76 and 82 per cent since 1989. The ‘moth snowstorms’ in our car headlights as we drove home are simply unknown today: when was the last time you had to stop to wipe bug-splatter from the windshield, or had to keep your windows closed to stop moths flying in at night? And if we, inattentive lumbering primates have noticed the drop off, how much more acute must it be for those creatures – birds, small mammals and reptiles – for whom this is their only or primary food-source? On my drive home, I am not sure whether to be grateful that such havens as Kingcombe exist, or filled with despair that they need to.